During the 1890’s and early 1900’s, after confinement at the Camp Verde and San Carlos reservations, the Tonto Apaches returned to Rim Country. They discovered former campsites and garden areas taken over by whites. Having no legal claim to their former lands, they moved on to new areas at Gisela, Payson, East Verde, and Weber Creek. Following their traditional way of life, they moved between winter camps in Tonto Basin to summer camps in the mountains. 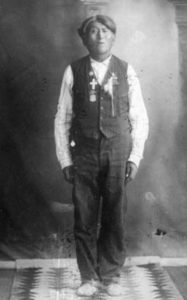 Some Tonto Apaches worked for the new settlers performing tasks such as wood cutting, farm work and washing laundry. Many worked on the construction of the Roosevelt Dam. After the appropriation of lands by the U.S. Forest Service in 1905, establishing their seasonal camps became challenging for the tribe. Chief Forest Inspector Bronson in Washington proposed a solution. He recommended free special use permits be issued to the Tonto Apaches camping on forest lands. Permits were issued beginning in 1909. In 1919 a Tonto Apache name Delia Calbalechis (Chapman) filed for a Homestead Trust Allotment of 97.5 acres on the East Verde River. When the allotment was awarded, it was understood this land was now legally home to the Indians camped there. During the Depression, the Tontos left the East Verde area relocating closer to Payson where they could find work. In 1930 a former scout for the U.S. Calvary, Tonto Apache, Henry Irving, paid $20 to receive a Trustee’s Deed for 2 lots on Indian Hill in Payson. Henry was proud of “the”paper” that proved his ownership. He knew to pay taxes on his property. Unfortunately, he did not know that the deed should be recorded in Globe. Many of Henry’s relatives joined him on his land. In 1938 Henry’s health was failing. He moved to Camp Verde to receive care from his daughter. His relatives remained on Indian Hill. They felt secure of their right to be there because Henry had “the paper” showing ownership. They were not aware taxes needed to be paid. The 2 lots were eventually put on the delinquent tax roles and sold for $3.25. The Tonto Apache families living on the hill were evicted during the years 1954 – 1957. 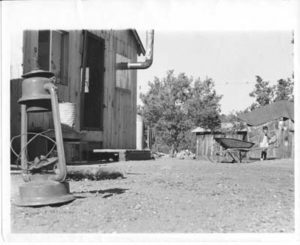 In 1954 Allan Curtis moved from Indian Hill to a camp on forest land at the south end of Payson (near the location of the present day Event Center). Most of the other Tontos followed. This area became known as “The Camp”. The Forest Service unofficially allowed them to live there. However, rules were strictly enforced regarding such things as the distance between dwellings. Cutting trees from the surrounding forest for firewood was forbidden. Wood to heat dwellings was obtained from a scrap pile at the sawmill where most of the men living at The Camp were employed. The requirement to haul garbage away from the camp was a problem because the majority of those living there had no vehicle. There were no facilities. No on-site water, electricity or phones.